In our patio cover gallery you will find different examples of styles and materials. As you can see, patio covers will transform a patio deck into a sheltered outdoor living area for children, pets, entertaining, and every day enjoyment. They are a very economical way to create a protected beautiful outdoor living area. Patio covers attach to the home so particular attention should be given to the method of attachment and weatherproofing. Patio covers are lattice, solid, or a combination. Your design should address electrical accessories such as outlets, fans, and lighting. Other popular features include ponds, fountains, kitchens and fireplaces. 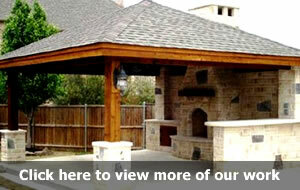 We build custom patio covers in and around Houston.